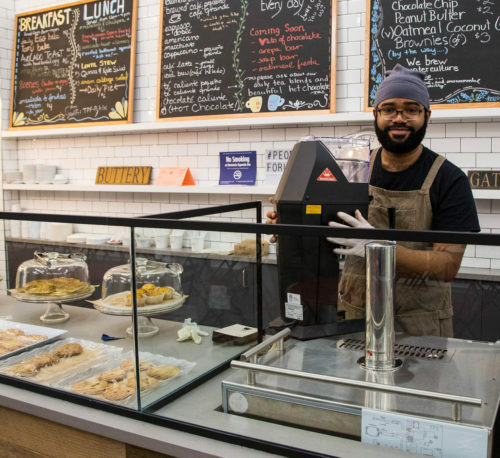 Employer Information: The People’s Forum is a new non-profit in New York City that serves as resource for, and collaborates with community members and organizations in advancing the struggles of the poor and dispossessed. 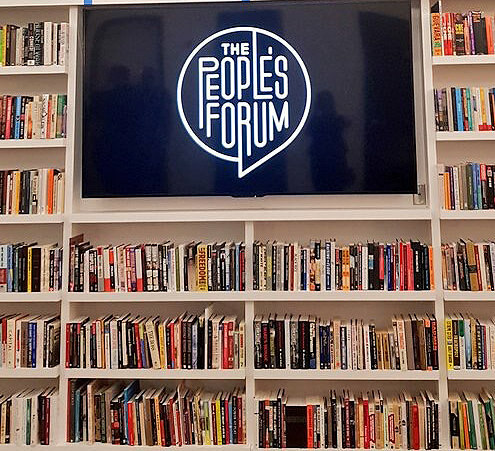 The People’s Forum is located in midtown Manhattan and opened in September 2018. Our Mission: The People’s Forum (TPF) is a movement incubator for working class and marginalized communities to build unity across historic lines of division at home and abroad. We are an accessible educational and cultural space that nurtures the next generation of visionaries and organizers who believe that through collective action a new world is possible. Position Summary: This is a Full-Time exempt position that reports directly to the Director of Culture. • Coordinates with cultural workers, educators, and TPF staff, as needed to organize public cultural-educational events that include, but are not limited to: workshops, exhibits, film screenings, panels, concerts, open mics, art-builds, classes and other special events. All events must align with TPF’s mission. • Collaborates with TPF Communication’s Manager to create online and printed promotion for the Cultural program. 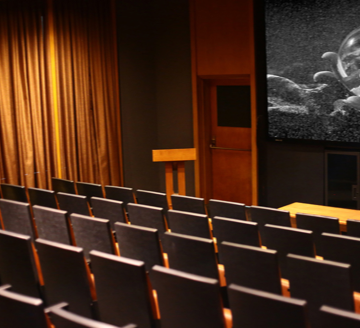 • Works closely with TPF AV and facilities team to arrange details for events, and to coordinate event logistics, including registration, attendee counts, presentation and materials support. • Reviews cultural proposals from potential partners and member organizations; and supports program director in determining approval based on its alignment with TPF’s mission. • Works with cultural workers, organizers, vendors, member organizations and partners to ensure that the cultural program uplifts the different ways in which culture is emerging from our social movements. • Coordinates a monthly space (i.e. community conversations, seminars, classes, etc.) with/for partner cultural workers to meet and deepen relationships, as well as introducing them to relevant information that supports their work. • Responsible for input and management of culture related data in our CRM database. • Responsible for calendar management and scheduling of cultural events and activities. • Prepare quarterly report of events, recommendations and action plans to aid the advancement of the cultural programming. ● A deep understanding of, and demonstrated experience uplifting culture work as a core element of teaching, learning and movement building. We offer a competitive salary that is commensurate with experience. We provide excellent benefits including full health insurance, life insurance, a 401(k) savings option, and paid time off. Additionally, our employees have full access to events and classes hosted at The People’s Forum. 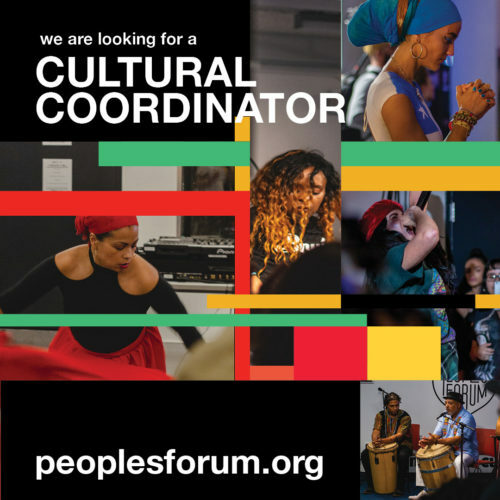 Please submit your resume and cover letter to the Director of Culture, Claudia de La Cruz at claudia@peoplesforum.org & the Operations Manager, AnneMarie Ladlad at annemarie.l@peoplesforum.org. Please include “Cultural Coordinator” in the subject line of the email. Position open until filled. The People’s Forum is an equal opportunity employer and expressly prohibits any form of discrimination based on race, color, religion, gender, sexual orientation, gender identity or expression, national origin, age, genetic information, disability, or veteran status. People of color, LGBTQ persons, and people from other historically marginalized backgrounds are encouraged to apply.